Clint Bowyer is one of the most engaging drivers in the Monster Energy NASCAR Cup Series. Normally, the 38-year-old Kansan sports a smile and offers a quick laugh or joke for all the friends and fans he meets and greets at the track, but there’s also a serious side to Bowyer that may become evident this weekend at Las Vegas Motor Speedway. Sure, he’ll likely cut up and smile as usual, but when he discusses his No. 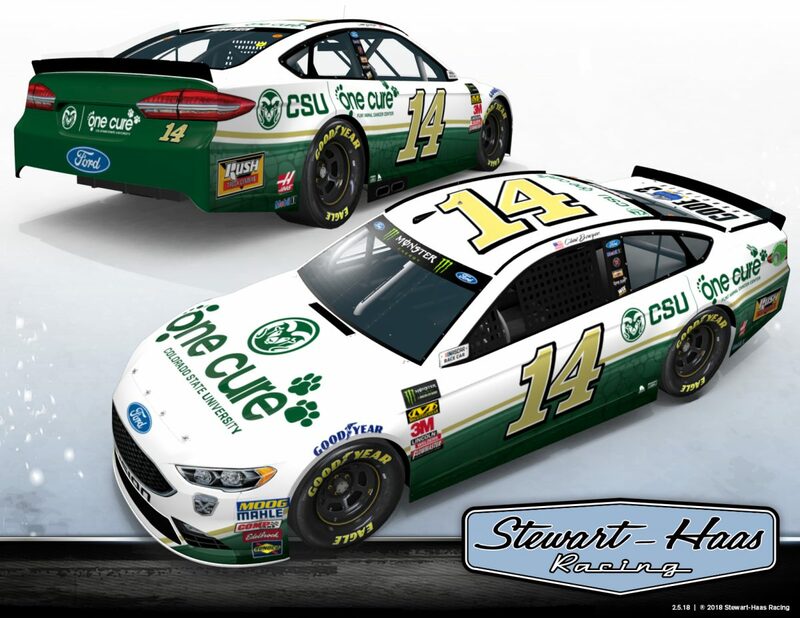 14 Ford’s Las Vegas sponsor One Cure, he’ll turn serious knowing the gravity of the cancer research One Cure is performing and the potential payoff. Bowyer said racing is fun and cool. But this is a whole other level. One Cure is a project led by the Flint Animal Cancer Center at Colorado State University. The One Cure program is founded on the principle that cancer affects all creatures and that treatment breakthroughs come through collaboration between scientists and doctors working with people and animals. This approach is known as comparative oncology and it is the guiding concept of One Cure and the Flint Animal Cancer Center at Colorado State. The center works to improve prevention, diagnosis and treatment of cancer in pets, and teams with the human medical field to translate research findings that will help people with cancer. The center, located in Colorado State’s James L. Voss Veterinary Teaching Hospital, sees more than 1,500 new animal cancer patients every year, with approximately 130 patients enrolling in carefully monitored clinical trials specific to their cancer type. The canine and feline patients are helping pioneer cancer research, moving cutting-edge treatments out of the laboratory and into clinical practice, ultimately providing hope to the next generation of animal and human cancer patients. SHR first featured the One Cure initiative on its No. 10 Ford in 2017. This year, it will appear on Bowyer’s No. 14 in several races with the goal of engaging race fans in the program by visiting www.OneCure.com, where they can learn about the research and to offer financial support, as well as to check out the No. 14 team merchandise. Bowyer hopes he can create even more attention for One Cure Sunday at the fast 1.5-mile Las Vegas oval. It marks his 13th start at Las Vegas, where he earned a second-place finish in 2009, plus three other top-10 finishes. Last year, Bowyer made his 400th Cup Series start there and earned a 10th-place finish, gaining seven spots in the race’s final stage. He’s riding momentum into Las Vegas after finishing third Sunday at Atlanta Motor Speedway. That finish, combined with Bowyer’s 15th-place finish in the season-opening Daytona 500, put him fifth place in the standings after two races. Do you enjoy Las Vegas? Is success important at Las Vegas?